This study explored the probability and outcome of delivery in women with placenta accreta spectrum (PAS) according to gestational age at delivery. A retrospective cohort study among women with PAS who had cesarean section was conducted. The gestational week (gw) of delivery and estimated blood loss (EBL) were recorded. 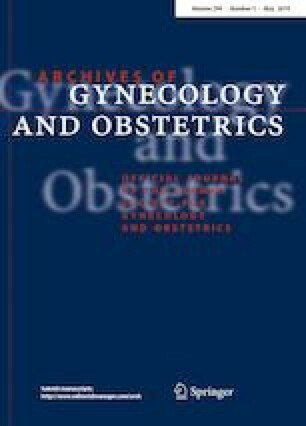 The proportion of urgent delivery beyond 32 gw and EBL in women with or without antepartum suspected diagnosis of placenta accreta was compared. Totally, 180 women with PAS were enrolled. Of these, 54 (30.0%, 95% CI 23.8–37.1%) were delivered by urgent cesarean delivery and 126 (70.0%, 95% CI 62.9–76.2%) by elective cesarean section. The probability of emergent delivery was increased from 3.1 to 5.7% at 33–36 weeks, and increased by > 10% beyond 37 weeks. Among 121 antenatal suspected PAS patients, 25 (20.7%, 95% CI 14.4–28.7%) had emergency cesarean section, and 96 (79.3%, 95% CI 71.3–85.6%) experienced elective cesarean. The EBL of PAS in both emergent group (r = − 0.276, p = 0.044) and elective group (r = − 0.370, p < 0.001) was significantly decreased with gestational age progression. The antepartum hemorrhage increased the risk of urgent delivery [OR 2.54 (1.19, 5.44)] (p = 0.016), while PAS with antepartum diagnosis decreased the risk [OR 0.21 (0.10, 0.43)] (p < 0.001). Although the incidence of emergency operation in PAS patients was increased at 32–36 gw, there was no significant difference among the groups. The decision of timing for pregnancy termination should be made cautiously. We recommend scheduled operation at around 36–37 gw. In serious cases, the termination time could be arranged as early as appropriate. The online version of this article ( https://doi.org/10.1007/s00404-019-05136-6) contains supplementary material, which is available to authorized users. Prof. YZ and Dr. YW design the study and wrote the manuscript. Dr. LZ and Dr. ZN collected the data, analysis the data, and wrote the manuscript. Dr. YC and Dr. AZ done the ultrasound and analyzed the data of this study. Prof. BM analyzed the data and wrote the manuscript. This work was fund by the National Key R&D program of China, 2016YFC1000404.